prevents hair loss, visual impairment or sleep disorders. 1-3 tablets daily with meals, or as directed. Daugelyje fiziologinių procesų įvairių vitaminų daryti jų poveikį kartu. Vienoje tabletėje Full Spectrum siūlo Jums labiausiai naudingų medžiagų jums reikia. Be to, įskaitant būtinų vitaminų, mes taip pat atsižvelgti į jų santykį vienas kito atžvilgiu. Dėl idealios poveikio mes pridėjome mineralų šią formulę taip pat. In most physiological processes the different vitamins exert their effect together. One tablet of Full Spectrum offers you the most useful substances you need. Besides including the necessary vitamins, we have also taken into consideration their ratio in relation to each other. For of ideal effect we have added minerals to this formula as well. Vitamins and minerals are important for health, yet many factors may adversely affect the amount and quality of our dietary intake and metabolic utilization of these vital nutrients. These factors may include use of pesticides, chemicals and preservatives, environmental pollution, the prevalence of overly processed and fast foods, mental or physical stress, as well as poor dietary and personal habits. 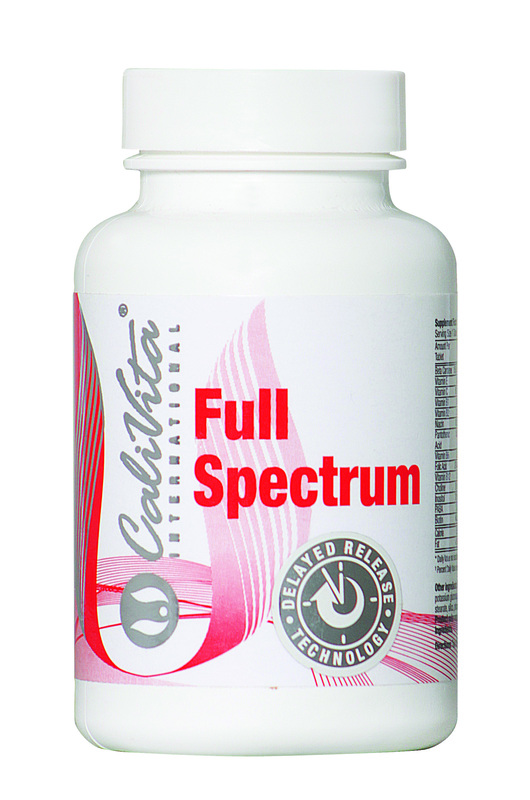 Full Spectrum provides, in a single tablet, a comprehensive range of vitamins and minerals, in optimum ratios, to help provide nutritional support for the normal and healthy functioning of all aspects of the metabolism. The minerals are in chelate form to enhance absorption, and the entire tablet is designed for time-release of the nutrients to ensure continuous, measured absorption. This is especially important as water-soluable nutrients such as Vitamin C, and the B-complex vitamins tend to empty from the body relatively quickly. This product is intended for adults only. It is not recommended to consume other supplements containing B-Vitamins, or iron while taking this product, except on the recommendation of a qualified medical professional. Some people may be sensitive or allergic to some of the ingredients in this product. Please read the label carefully, and avoid taking the product if you are sensitive to any ingredient. If you are not sure, consult with a qualified physician before taking the product.